High-velocity clouds are not homogeneously distributed across the sky. Instead, they form large complexes, some of which extend over tens of degrees. The most famous and extended complexes in the northern hemisphere are complex A, C, and M, the first two of which were among the first HVCs ever detected in H i emission by Muller, Oort, and Raimond (1963) with the 25-m radio telescope near Dwingeloo. The southern hemisphere is dominated by the H i emission of the Magellanic Clouds, the Magellanic Stream, and the Leading Arm. In addition to these large and prominent HVC complexes there are numerous compact HVCs all across the sky. Some of them have been grouped into complexes, including complex L, the complexes in the direction of the Galactic centre (GCP and GCN), or the so-called Wannier clouds (WA–WE). Other compact HVCs are completely isolated from any of the known complexes (e.g., Braun & Burton 1999), and their distances and origin are not well constrained. Fig. 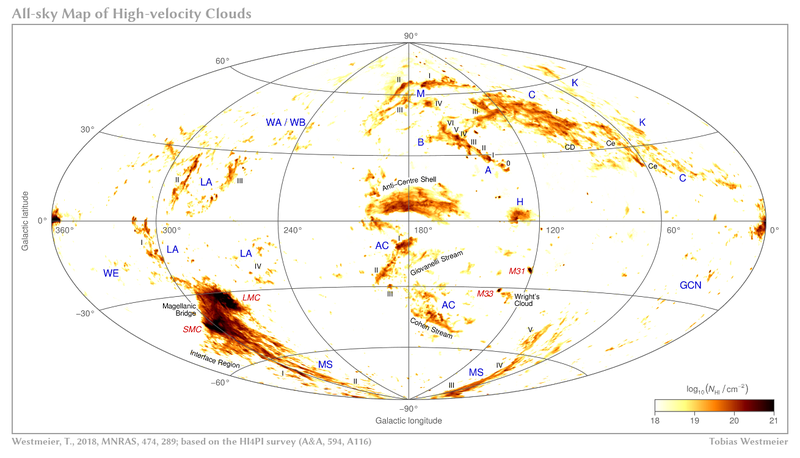 1: All-sky false-colour map of high-velocity clouds. Intensity corresponds to H i column density in the range of 0 (black) to 1020 cm−2 (white), while hue represents LSR radial velocity in the range of −480 (red) to +480 km s−1 (purple). 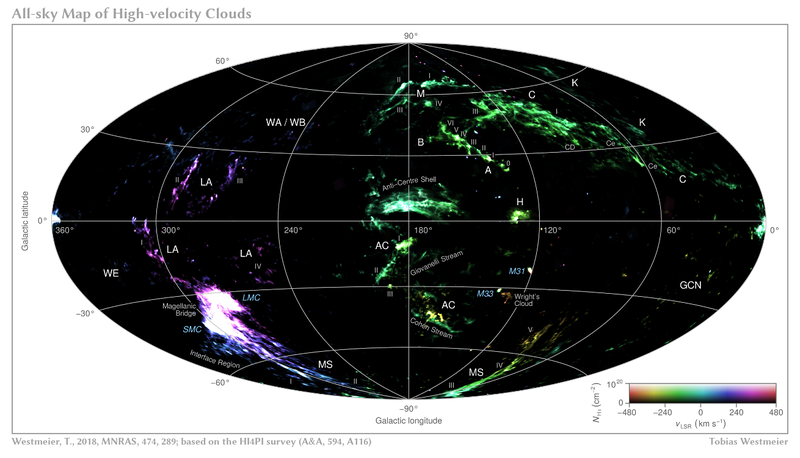 The map was generated from the HI4PI Galactic H i survey (HI4PI Collaboration 2016) on the basis of a simple model of the gas distribution in the Milky Way. For each position in the sky, the allowed range of radial velocities for Galactic H i emission was derived by determining the lowest and highest radial velocity along the line of sight within the boundaries of the Milky Way model. The resulting radial velocity range of the Galactic hydrogen was then extended in both directions by a deviation velocity of 70 km s−1. All emission outside this extended velocity range was considered high-velocity gas and was integrated to create the column density map above. 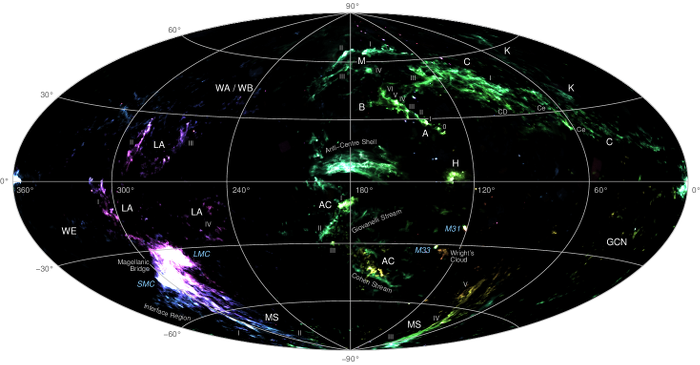 Although great care was taken to remove Galactic emission and radio frequency interference from the data, a few artefacts are still likely to be present in the final map, including residual Galactic emission (e.g., from the so-called Outer Arm) and stray radiation residuals in the northern sky. In addition, some HVC emission could be missing due to kinematic overlap with the H i emission from the Galactic disc. Therefore, the map should not be used for a quantitative analysis of column densities. For this purpose one should directly analyse the corresponding data cubes from the HI4PI Survey which are available for download at the Centre de Données Astronomiques de Strasbourg (CDS). 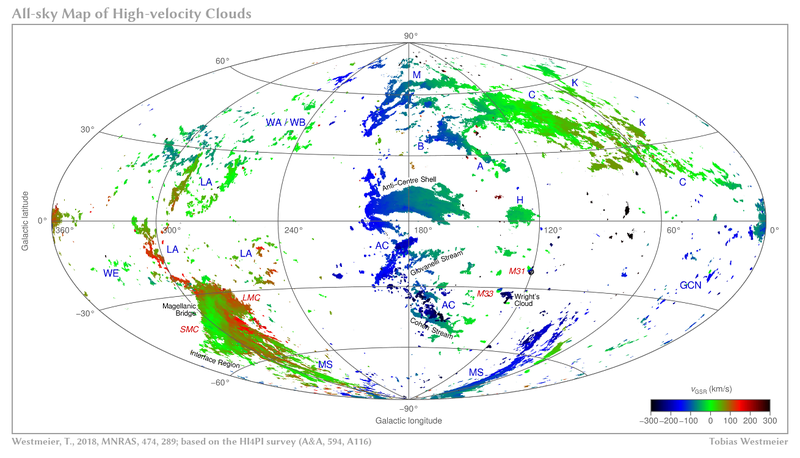 H i column density and radial velocity maps of the HVC sky in different projections and coordinate systems are made available below in either FITS format or as PNG images. I cannot give any warranty with regard to the accuracy and correctness of the data products provided on this page. Any use of the data is at your own risk. Please include a reference to the original paper (Westmeier 2018, MNRAS, 474, 289) in any publication resulting from the use of these data products. Important notes: Projection codes are CAR for plate carrée and AIT for Hammer–Aitoff projection. Note that images in Magellanic coordinates have Galactic coordinates defined in their header, as the FITS standard does not natively support the Magellanic coordinate system.